Peanut butter ice cream is sandwiched between gooey brownies to make these Brownie Ice Cream sandwiches – they are a decadent and delicious summer treat! What’s your favorite ice cream flavor? I have a hard time choosing one – you should see me in an ice cream shop. I sample as many as they will let me, and then still can’t make up my mind! But chocolate peanut butter anything is at the top of the list, and it is TheBetterHalf’s absolute favorite, so that is what I usually end up getting. And I have never had a better peanut butter chocolate ice cream flavor than the Double Peanut Butter Chip from McConnell’s. I take my ice cream very seriously so you can trust me when I say it is the absolute best. Then, when you sandwich it between brownies, and add some mini peanut butter cups to the mix, well the result is one of the best summer treats ever – Peanut Butter Brownie Ice Cream Sandwiches. How is it already August?! It is hard to believe, but summer is almost over. I feel like I haven’t even made a dent in my summer to-make list. There are so many tomato and corn and berry recipes that I want to make before it turns into pumpkin and apple everything – I need to get cooking!! I have a Giveaway today that will help ease the sadness of summer ending…a $325 Visa Giftcard! I have teamed up with some other amazing bloggers to bring you this giveaway, just in time to start back-to-school shopping! Scroll to the bottom of the post and enter to win! KitchenAid Stand Mixer and Ice Cream Maker Giveaway! 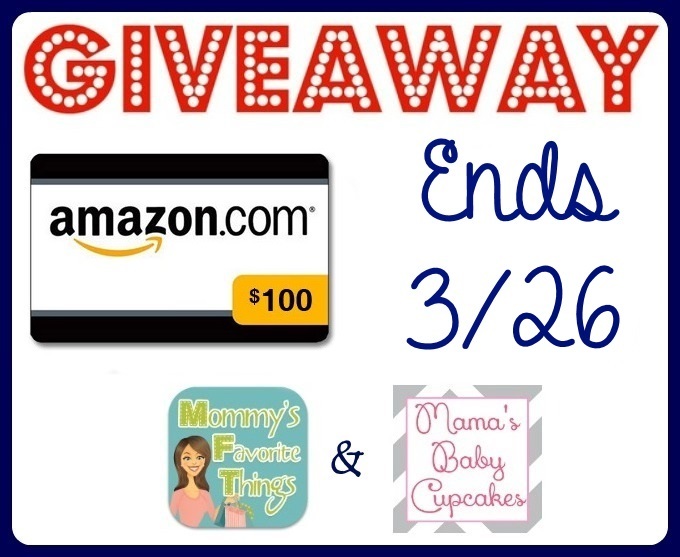 Enter To Win $100 Amazon Gift Card! Welcome to this fun Amazon $100 Gift Card giveaway. Mommy’s Favorite Things and Mama’s Baby Cupcakes have brought together a group of great blogs to co-host this prize for one lucky winner. With Amazon, the possibilities of purchases are endless, but with Spring around the corner, we thought now would be a great time to help one lucky winner with this giveaway to possibly expand their out door fun. All you need to do is enter the Giveaway Tools widget below, come back for daily entries, and up your chances to win big! This giveaway is brought to you by our co-hosts you’ll see below. Mommy’s Favorite Things is responsible for sending Gift Code. Open to US and Canadian Residents, 18+years of age. Void where prohibited. Fluffy yellow cake is iced with a peanut butter chocolate buttercream frosting. This birthday cake is the perfect treat to make for a chocolate peanut butter lover! Happy 2nd Birthday to Chez CateyLou! My little blog is two years old today! And to celebrate, I made a birthday cake! Because birthdays need cake. And sprinkles. Lots of sprinkles! Our absolute favorite dessert flavor is chocolate peanut butter. TheBetterHalf and I are crazy for anything with that combo. Muffins. Brownies. Cookies. Cake. I even made peanut butter chocolate chips pancakes for breakfast this weekend (must share that recipe with you ASAP!) So when I was deciding what kind of cake to bake for the big 2nd birthday, I knew that chocolate and peanut butter had to be involved – Yellow Birthday Cake with Peanut Butter Chocolate Frosting, and a little extra peanut butter filling in the center. This is one amazing cake!! And to celebrate Chez CateyLou’s 2nd birthday, I’m hosting a giveaway of $50 to Amazon!! Scroll to the bottom of the post to join the party (aka enter the giveaway)! !